Your big date is coming up but are you ready to show off those nice legs? If you’re not much into waxing, then leg shaving remains the least expensive option for you. Here are six tips to make sure that you’re doing the right and pain-free way to a flawlessly shaved legs. There are hundreds of options out there so it takes a little bit of experimenting before finding the right one. Choose one with moisturizing strips and spring-mounted triple blades to get a closer shave. Ensure that you change razors regularly as dull blades are more prone to nicks and cuts. Exfoliate your skin using an exfoliator or exfoliating gloves before having a shower. This helps to remove dead skin cells and ingrown hairs that may clog up the razors, preventing a close shave. To prevent cuts or razor burns, never shave legs when dry. It’s best to begin with legs soaked in warm shower to soften the hair. Shaving naturally exfoliates the skin, so if you shave on dry legs, you can be sure that your razor will be clogged up with dead skin cells. Choose something with moisturizers in it to ensure that your skin stays smooth and nick-free. If you don’t have one, hair conditioners and olive oil will work just fine as they contain moisturizing properties. 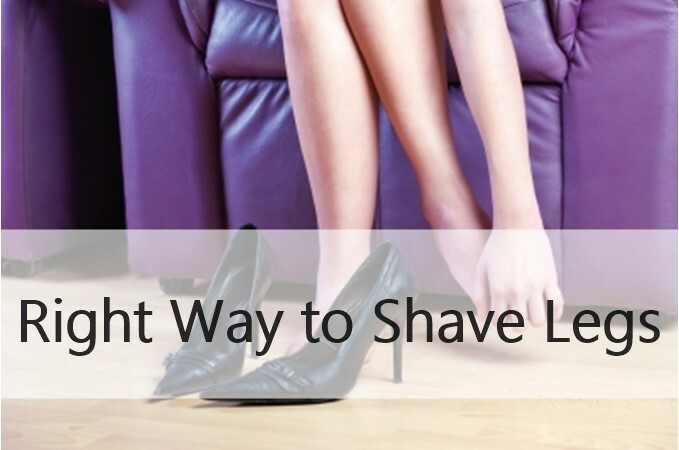 Starting from the ankle, glide the razor gently up your legs in a direction opposite of the hair’s growth. It’s important not to rush to get a smooth finish. Go back to the same area three times to remove all the hair. Don’t forget to shave around the inner and outer thighs, as well. Always rinse the razor frequently and allow it to air dry for next use. Rinse off shaving cream from your legs with warm water and pat dry with a towel. Apply a moisturizing lotion or cream to lock in moisture and stop it from flaking. Now back to you. Do shave your legs, too? If yes, can you share some of the tips you know to shave it painlessly. Disclaimer: When you click and buy products from this blog, I may earn a small commission for my endorsement, recommendation, testimonial, and/or links to any products or services. Your purchase helps support my work in bringing you valuable content about health, wellness and productivity. Good for you! I have hairy legs that I had to really shave them especially when I’m planning on wearing a dress or shorts. Shaving does take so much time and patience but that’s what you get when you don’t have money for waxing. I’ve started shaving my legs since high school and it actually became part of my daily regimen for almost 5 years. I used the ordinary Gillette razor (yellow) but moisturized heavily afterwards. It’s not for the lazy though. I got out of it a few years ago when I decided to wax. Where do you usually wax your legs? I bought the self-waxing kit few months back but never actually used it yet. Thanks, Anne! At least you don’t have “hairy” problems to deal with. Haha. omg. i always shave my legs dry. thanks for the tips! You’re welcome. Shaving them after shower makes it easier and minimizes the cuts from razors. I can’t really relate to this since I don’t shave my legs because I have super thin hair in my arms and legs so there’s no need for shaving. Hehe. But this is definitely helpful for the ones who do. Wow, that’s awesome. At least you don’t have to worry about shaving your legs. My legs are so ‘balhibuon’ but I never EVER tried shaving nor waxing because they say that maka-baga daw siya sa hair and it’ll make you look like you have men legs. I’ve seen my friends’ legs looking like one and it looks really bad maong mahadlok jud ko. My leg hair is not thick but too plenty, literally plenty. Ugh I need your help about what should I really do hahahaha. I understand that fear as well since I’ve basically been told the same thing before. But my legs are so hairy, I really can’t stand looking at them without feeling annoyed. I have heard of Intense Pulse Light (IPL) which they say is effective in removing hair without any pain or abrasion. I haven’t tried it yet but you might want to check that option. Well, shaving is not for everyone. The important thing is to be happy with what you have and show that with confidence. Yes, please share them with your friends. They might find this useful. I haven’t tried shaving my legs but some of the tips here might be applicable when shaving my… toooooottttt…. beard off, hahaha. Hahaha. Whatever floats your boat Jeph.